Poverty simulation in the DUC. Photo courtesy of Marcus Harris. The Missouri Community Action Network recently hosted a simulation in the Donius University Center Atrium, Sept. 11, to give an interactive experience for students on how people in poverty live in the United States of America. The simulation lasted for a four-week cycle and each week lasted for about 15 minutes. Students received identities and background information about their characters and their families’ situations. Students that were parents had to worry about traveling from their home to work, to the grocery store, to the bank and other locations if the need arose. Each location they traveled to used up one of their transportation tickets that represented the costs of maintaining a vehicle. Children went to and from school without using tickets but were easily kicked out of school for the week or arrested to represent a low funded education system, such as being late or being disruptive. A police officer came and took students away when the teacher called for him. One of name tags to meant identify one of the many characters inside the simulation. Photo courtesy of Marcus Harris. If someone’s character was of a young age, instead of spending some time in the jail area, they were sent to social services. A parent would have to come to pick them up, using up one of their few tickets. Those in jail or social services were released at the end of the week if they weren’t released through a bail payment or picked up by a parent. When families were reunited at home after work and school, they could start planning their actions for the next week. Even through pawning belongings, applying for food stamps, cutting corners, or perhaps even stealing, some in the simulation were evicted from their homes. If a family wasn’t homeless, they may have had their utilities shut off. Those who remained were likely in jail. At the end of week three, it was announced that the jail and homeless shelter were both full. Evicted homes, represented by overturned chairs with evicted signs, were scattered throughout the community. 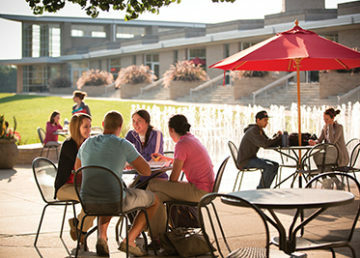 By the end of week four, a group discussion was held. All the students had different experiences during those four weeks, but everyone agreed that their situations were unpleasant overall. As students talked about the situation their characters were in, one participant confessed to needing money for bail because people he knew had been arrested. He attempted to steal money from members of the community. It may have been a simulation, but he resorted to crime, as some do when they are in a trouble financially. “Somebody did steal a bit of money from my ‘family’,” said Caleb Knobel, one of the students in the simulation. Whether or not the person who confessed to stealing was the same that robbed Knobel’s family is unknown, but it was later revealed that the volunteers that helped put on the event stole from participants at every given opportunity. The main lesson that the organizers wanted to teach everyone was to give a personal experience of how it feels to struggle every day with common expenses. The point to the hour-long activity was to spread awareness about a problem that some Americans deal with. Circumstances beyond their control can mean facing issues covered in the simulation. Knobel learned the hardships of poverty due to his character’s background. He was unemployed and received the task of running errands for his family, making the simulation difficult. “I somewhat have a better understanding of what it’s like to live in poverty,” said Knobel. The interactive experience hosted by Maryville allowed for students to get an inside look on the difficulties of American citizens in poverty. 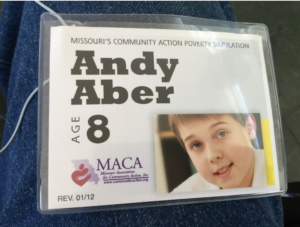 To learn more about the poverty simulation from the Missouri Community Action Network, go their website here.